Thrift Store, will now be located at 5243 Hwy. 70 West, Morehead City, NC, is our largest fundraiser. 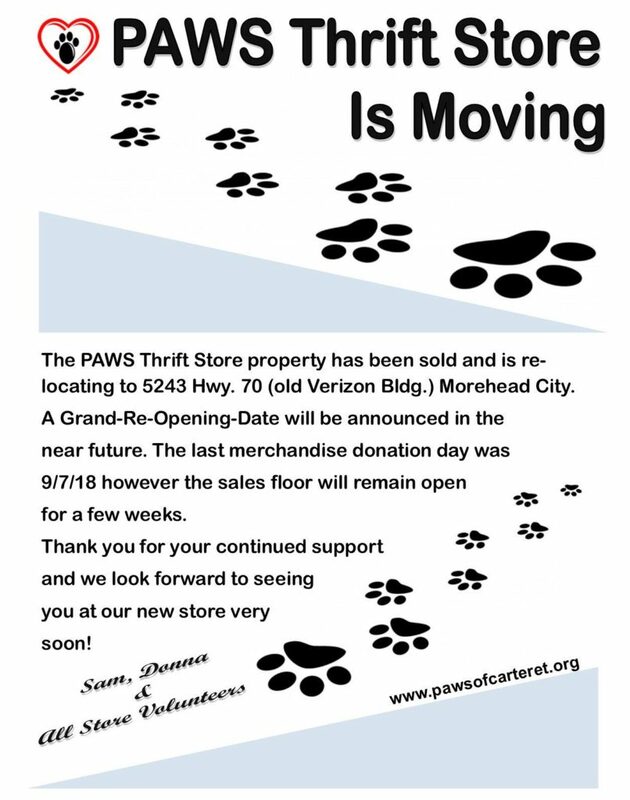 Watch for the 2019 relocation and grand Re-Opening of the PAWS Thrift & Gift Shoppe! Thanks to our hard working volunteers the store provides funding for the organization’s daily operations, and ongoing care and rehabilitation of less fortunate pets. You’ll find that there is always something of interest going on, whether it’s a shopper who brings along a pet, (always a hit with the shoppers & volunteers), or the unusual assortment of brand new and slightly used donations that are guaranteed to change from day-to-day. To share in the savings and find that treasure you’ve been searching for, come visit us soon. We will announce a re-opening of our new location soon! New volunteers will always be needed and welcome. If interested, please call or apply online until we can re-open. Apply via our online volunteer application or call 252-241-9408 with any questions you might have. Our NEWEST location will be equally exciting and we will share this with you very soon! This is a pet-friendly store with a dog waste station on the property. Non-aggressive, healthy pets are welcome to shop with their owners. All pets must be kept leashed. A short leash rule in the store is in effect, and “Please-No-Fleas”! The animals thank you greatly for all of your continued support!